Hello Readers! 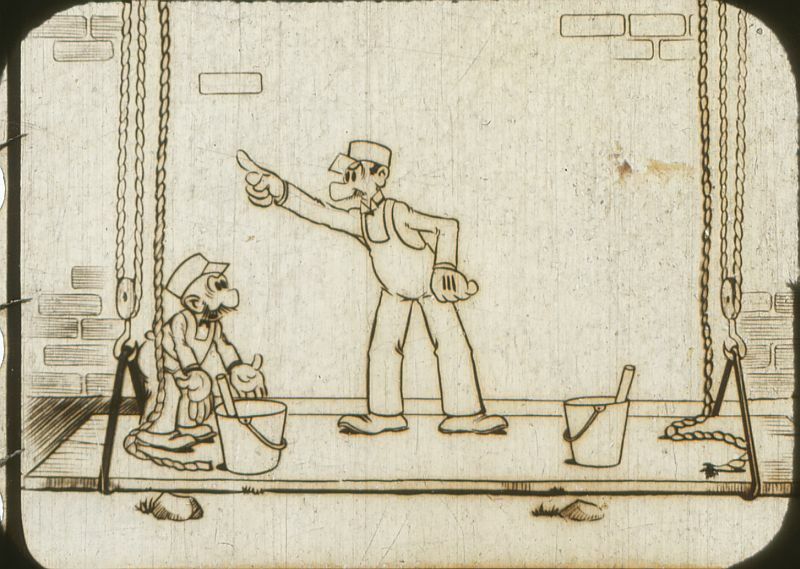 Here’s a nitrate 35mm frame from a silent Mutt and Jeff (note it’s full aperture), which has been in my frame clips envelope for many years. It’s interesting that nitrate frame clips will sit in envelopes without any deterioration at all as long as they are fully exposed to air. Anyway, does anyone have any idea of which M&J this frame could be from? 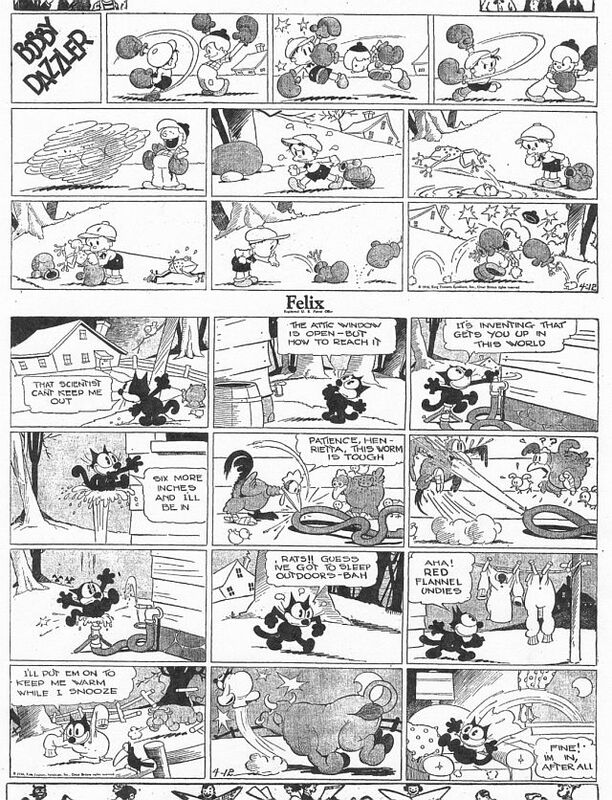 Felix can’t get no respect again in the strips from 4-6 to 4-12-1936. Felix has to get all spiffified and pretty to stay in Danny Dooit’s house this week, he envies the pigs! My favorite gag in the dailes is the 4-11, as Daddy Dooit grabs Felix instead of his black tie. This was a yuck! Messmer is in top action form in the Sunday page for 4-12, I love the boxing glove and frog drawings in Bobby Dazzler and Felix’s expression as he lands on the sprinkler in panel seven of his own strip is beautifully drawn. Krazy from 9-23 to 9-28-1940 is mostly Mrs. Kwakk-Wakk’s moment to pry into everybody’s business. I like the discussion of Krazy Kat’s nature she instigates in 9-23, and the gag in the 9-27 is the “fourth dimensional” sort that Herriman loved to do, in this case the sound effect “PEEP” from Krazy’s egg misinterpreted by Mrs. Kwakk-Wakk as criticism of her actions. Garge brings back the “Doormouse” once again in the last panel of the 9-28. 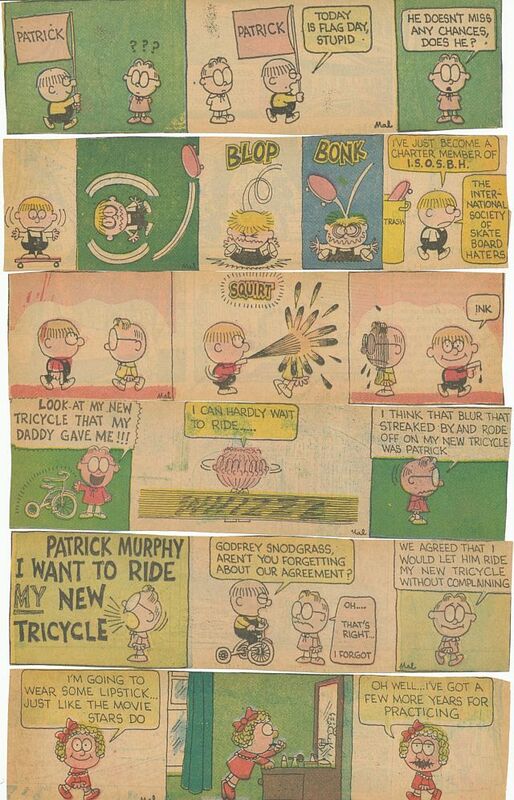 Patrick continues to dominate Godfrey Snodgrass this time in strips from about 6-25-1966. These are not precisely ID’d date-wise, but the continuity of the strips seems plausible, so they could end with 6-30. This must have been early in the day of skateboards, Patrick takes an instant dislike to his in the 6-26 (?). Godfrey loses control of his tricycle to Patrick in the 6-28 and 6-29 (?) episodes. If any on you comic strip mavens can more precisely nail these down, please let me know. Thanks to Paul Penna and Charles Brubaker for your comments last time. I’m glad you liked the Snafu animation, Paul. It was enjoyable to do it, much better than storyboarding any day. I’m glad you liked the Snafu DVD, too Charles. I’m glad you enjoyed our Christmas card. See you readers (both of you) next time! Happy New Year! You are currently browsing the Mark Kausler's CatBlog blog archives for January, 2011.